Alice’s Adventures in Operaland presented by Victorian Opera in partnership with Arts Centre Melbourne, is a performance specially designed for the enjoyment of children with special needs, it takes Lewis Carroll’s much loved story and recreates it in a relaxed setting, taking audiences on a magical adventure through music. The production features Victorian Opera’s emerging artists, students of the Master of Music (Opera Performance), a partnership between Victorian Opera and Melbourne Conservatorium of Music, University of Melbourne. Ahead of this special performance on Sunday 24 May, Victorian Opera’s Community and Engagement Officer Erica Rasmussen spoke with Jessi Lewis about this new work and the company’s continuing commitment to creating performance works that are accessible to all. Victorian Opera is proud of its history and ongoing work to make opera accessible for all audiences. The company creates works specifically for children, tours productions in regional areas and staged its first ‘relaxed performance’ in 2014 – the first staged in Victoria. A ‘relaxed performance’ is an adapted performance for children with disabilities. The performance creates a relaxed environment with elements of the production adapted to reduce anxiety or stress. Lighting and sound levels are adjusted to soften their impact, there is a relaxed attitude to noise and moving around the auditorium during the performance and designated ‘chill-out’ areas to use if being in the auditorium becomes overwhelming. Prior to the performance, families attending are provided with a visual outline of the production to introduce the characters and explain the story. Information regarding the venue and theatre is also provided to reduce stress or anxiety about visiting a new place. It’s a wonderful initiative, has Victorian Opera worked from any past productions as a starting point for this work? Following the ‘relaxed performance’ in 2014, our 2015 children’s opera Alice’s Adventures in Operaland was developed to be accessible for all children. In 2014, Victorian Opera’s production of Hansel and Gretel was adapted to a greater extent given some of the story elements, such as The Witch, and certain visual effects. In this regard, we were guided by our experience to craft a production which could be enjoyed by all audiences with little to no change. The only major adjustments will be the lighting and sound levels. There must certainly be some great/positive outcomes and responses to this performance, what has been a highlight of the process thus far? Following our experience in 2014, the entire team at Victorian Opera was incredibly proud to create a work and provide an experience so rarely available to children with disabilities. Seeing the audience’s reactions and how much they enjoyed the work was so satisfying and an incredibly positive outcome. 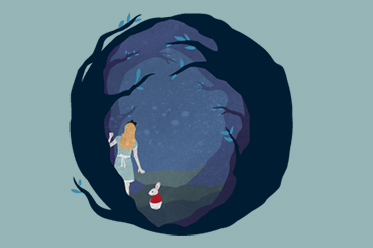 Alice in Wonderland has been and continues to be a classic and much loved story for both young and old, how has creating an opera from this story come about? The director, Libby Hill dreamt the idea of Alice and the White Rabbit entering into different operatic worlds several years ago; it was the perfect way to introduce young people to the beautiful music of opera without necessarily sitting through a full-length opera. By structuring the show as an adventure through Operaland, the show’s pace and tone was incredibly flexible and could be tailored for children. This being the second relaxed performance presented by Victorian Opera, was there any lessons learnt through the staging of Hansel and Gretel last year? Following our experience with staging Hansel and Gretel last year, the production’s director and Victorian Opera’s Executive Producer, Libby Hill became aware of how exactly to adapt a work for a ‘relaxed performance’. Alice’s Adventures in Operaland was subsequently devised with this in mind. Following our focus group consultation with educators and parents of children with disabilities, it was very pleasing to note that the only adjustments to the production were the lighting and sound levels. Introductions to the cast and orchestra will also be made at the start of the performance – as happened with our first relaxed performance. For more information and bookings, visit: www.victorianopera.com.au or www.artscentremelbourne.com.au for details.